Acontius firewing Catonephele acontius, photographed by Joseph Tobias. The Biblidinae is a primarily Neotropical group of butterflies, distinguished by the structure of the male hypandrium (Wahlberg et al. 2003). [B66] Butler, A. G. 1866. 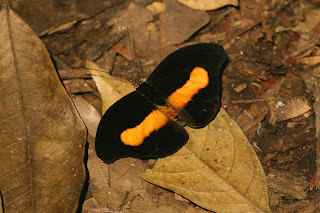 Notes on some species of butterflies belonging to the genus Catagramma. Proceedings of the Zoological Society of London 1866: 578-580.